The sponsors, Price Waterhouse Coopers, provide an excellent range of monthly prizes. Mid year, the league is interrupted with the “Mid League Bash" a Texas scramble format competition where players from all teams are mixed together. The whole philosophy of the league is for players to have a good match, meet new people and enjoy the outing. Of course, these societies also run their own regular tournaments aside from entering a team into the PWC Golf League. 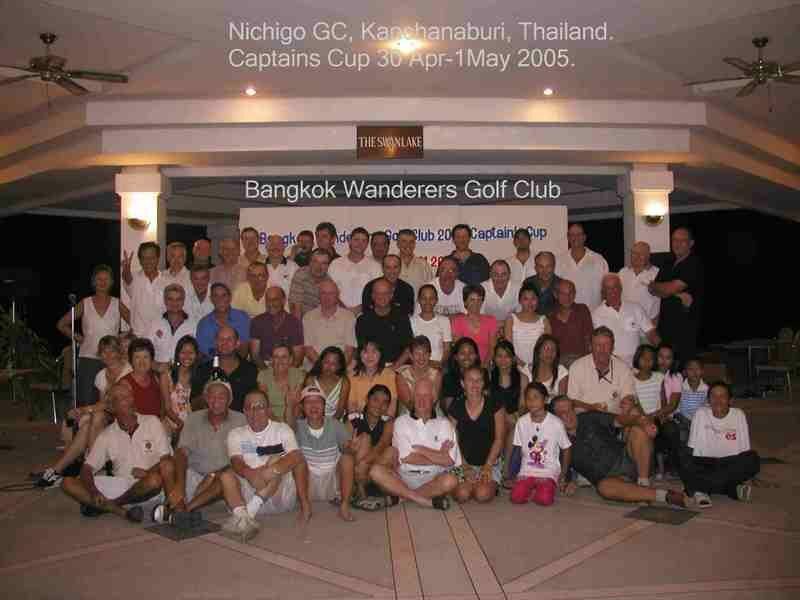 Typical is the Bangkok Wanderers Golf Club, a friendly society comprised of fairly eclectic, sometimes eccentric, individuals living in and around Bangkok. Lifetime membership is only 200 baht (yes around $6 US) and a Wanderers handicap is given after submitting cards at three events. The Wanderers have a comprehensive programme:- “The Majors” are: The Captain’s Cup, a 2-day event held every year around April/May, The Masters, a 1-day event held around July, and The Club Championship, a 2-day event held early December. Year-long events include an Order of Merit, a point scoring system at all events during the year, an Annual Stableford where the best four stableford scores during the year are added together, the Bangsai Eclectic – a Monthly Medal is held at Bangsai Golf Club with an eclectic score being calculated over twelve events, and a Matchplay knockout. Other trophies include The Fred Wade Challenge played annually against The Golfer’s Cocktail Lounge, the Mackenzie Cup, a 2-day pairs competition, and the Magpie Putter played annually against the British Club. Some societies make visitors welcome. One such is The Honourable Golf Society of Hogs Breath Masters. They organise a Monday Early Bird event, a Tuesday Banker outing, both at Bangkok Golf Club, and a Friday Early Bird at the Royal Golf & Country Club. For lady golfers living in or visiting Thailand, there is the Bangkok Cosmopolitan Ladies Golf, which was founded in 1969 and plays every Tuesday morning at various courses around Bangkok. It offers regular, friendly and competitive golf for ladies of many nationalities, but stresses the social side. Some of the groups above have active ladies’ sections, such as the Golfer’s Cocktail Lounge and Bangkok Wanderers. If you would like any or have any more information on any of the named Bangkok golf clubs, please feel free or post a comment or if you prefer drop me an email at my Thailand golf vacation company and I will take care of the posting duties. Tomorrow I will continue this series and post about Thailand golf clubs outside of Bangkok.